It is a lovely, small (65sqm large) flat, very special for its location. In fact it is at 1 Km from the Lucca train station and 1.5 Km from the centre, and it is possible to get there just by walking along the 1800 'Acquedotto'. It is at the second (and top) floor of a small condo, 1.5 Km south of Lucca. There is an entrance/hall and a small wall dividing the kitchen from the living room. From this area there is access to 2 terraces, one small (a service terrace with heating machine, a basin, etc) and one bigger, from where there are very beautiful views on the '1800s Acquedotto' (200 m) and the towers of Lucca. This terrace is big enough to have a table for lunch/dinner for up to 4 persons. There is a bathroom with shower and 2 bedrooms, one double and one single bedroom. There is the possibility to accommodate one more person on a sofa' bed in the living room. There are washing machine and dish washer. Special car rental rates with the possibility of: pick-up at the airport and drive to your property. Excursion to our own Wineries in the Chianti area producing excellent wines with visit to the vineyards, the wine cellar and final wine-tastings with the owners. Possibility of guided tours of the town of Lucca, its villas, and special tours in the countryside. Possibility to play golf in four courses at a distance of 25 up to 40 min drive. Individual tours: : - To discover the ' Cinque Terre' by our 20mt long sail boat. - Guided biking tours through the Tuscan countryside. My husband and I spent 3 weeks in this lovely flat. Genni and Dario met us at the appointed time and were beyond hospitable. They were most helpful with any questions we had and gave detailed instructions from the start. My sister in law was able to stay with us for a few days and Genni and Dario were most accommodating with regard to her visit. We enjoyed the perfect location to Lucca - very easy walk to the walled city which kept us from driving in the heavily trafficked areas - and the train station. We were able to train into Florence for a day and drive our car only 30 minutes for a day on the coast. We enjoyed an amazing time in Lucca and quickly fell in love with the area. After many trips to Tuscany, Lucca is the desired destination in which we will return. And we will again request to be guests of Genni and Dario. Amazingly beautiful people! Grazie mille. This place is a gem. Very close (5-10 min walk) to the walled part of the city of Lucca and equally as close to the train station for access to many cities around Tuscany. 30 mins to Pisa, 20 mins from the coast of Viareggio, 1 hr by train to Florence, 1 hr to Cinque Terre, 1.5-2 hrs to Siena, 2.5 hrs from Rome. Basically you can use this as your jumping off point for a day trip. The apartment includes everything you need to make meals at home, has a nice balcony for relaxing and reading, has surprisingly fast internet, and also a clothes washer which is very convenient. It's a quiet and peaceful place to lay your head at night after a long day of sight seeing. Dario and Genni are a truly sweet and hospitable couple that are very helpful and prompt to answer any questions. We are so happy that we found this apartment and the wonderful city of Lucca and hope to be back soon. Thank you for your words. Genni and I are very happy to have hosted you in our apartment and in Lucca. Hope to meet you soon again. 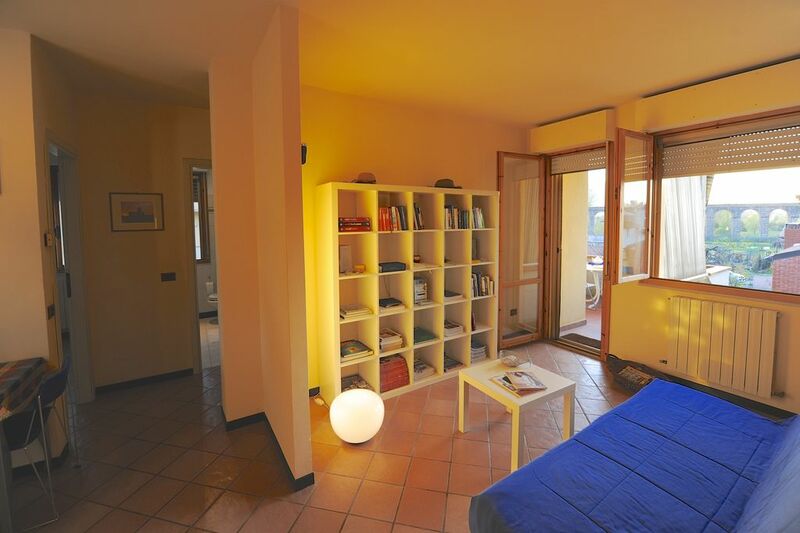 A lovely, clean no frills flat outside the walls but easy walk to Porte San Pietro. Dario and Genni were wonderful hosts with very good dining and biking recommendations (CicliMax rocks for serious bicyclists).We thoroughly enjoyed the time in a quiet neighborhood, not a tourist in site! A good fit for those who enjoy a true local experience. Thank you for your visit. Hope to meet you again another time! I absolutely loved my stay here. The owners Dario and Genni are both so kind and thoughtful. If you need anything, all you have to do is ask. It is on the top (3rd) floor, so there is no one above you. Very quiet and peaceful. As well, you get a beautiful view of the aqueduct from the balcony just off of the living area. Nice place to sit and read and have a tea or coffee! So relaxing. I also enjoyed going for walks exploring the area. If you are a cyclist , there are so many routes directly from the flat. (Dario is an avid cyclist and an encyclopedia of information) You are also close to Chrono bike shop within the walls of Lucca . It is the best bike shop I have ever been to. You can rent any kind of bike and they are all so helpful. The apartment has many windows so you get lots of natural light. It feels spacious and airy. I had excellent sleeps here. Comfortable bed and pillows......nice breeze. Having a parking stall is convenient too! It is about a 10 -15 minute walk to the walls of Lucca. I looked forward to in the morning. We spent a week in this apartment in April with our three teenagers during a five week trip. The location was a welcome, quiet stop between large cities and we enjoyed walks into the old city, renting bikes for a ride around the wall, and getting our water from the aquaduct spigot. There was plenty of room for us five, tall Americans even when we felt "stuck" inside due to rain. The views were lovely and our walk along the aqueduct away from town met with our hopes for introducing our children to the scenic Italian countryside. We took a day trip to Pisa and planned an easy trip to the Cinque Terra but the weather was uncooperative that week. *Note - (taken from another post) "I would get off at Pisa S. Rossore as it's just a couple of minutes walk to the tower. I haven't been in that station in several years, but you used to just walk across the tracks after getting off. The station did not have any services so buy your return ticket at at one of the shops by the tower with the Trenitalia logo (sometimes the machines don't work in the stations)." We took the train all the way into Pisa Centrale, not trusting this advice. We bought bus tickets to the tower, then had a nice walk back to the train station. It is nearly a straight shot down Via Roma with a bit of a jog near the train station (look at a map!). On our return trip, we looked out the window to see the tower from the Pisa S. Rossore station!! Oh well. At least it wasn't raining! Genni and Dario instantly became some our favorite people with their cheerful personalities and helpfulness. They gave us a number of recommendations for food, gelato, and a lovely wine shop. We recommend this apartment if you are looking to be near the train station but closer to the green countryside than the town. It is lovely and the neighbors across the hall were friendly. Thank you for your note. We are really happy to hear that you have spent such a great time in Lucca and in our apartment. We really hope to see you again one day!! Dario and Genni were lovely - they collected us at the Bus Station and took us back to the railway station. They also gave some good recommendations for restaurants, most of which we tried and enjoyed. It is really nice to leave our guests such a good memory! The location of this flat is really special. It is just in the middle of a beautiful countryside and in the same time it is at walking distance from the train station and the walled town of Lucca. From the terraces there are spectacular views on the 1800 'Acquedotto', the walled town of Lucca with its towers, and the hills all around. Lucca is a small city with a rich history that is magically preserved. The Roman city, the medieval city, the Renaissance city, the nineteenth century city: traces of all of these may still be found here. A walk through the centre of Lucca becomes an exciting voyage through the centuries, through history. Apart from the significant monuments, such as the sixteenth-seventeenth century walls, Lucca stands out for its atmosphere and lively centre, with its cafe, shops, restaurants. Thanks to its northern location in Tuscany the beautiful beaches of Viareggio and the renovated 5 Terre are very easily reachable, by train or by car. Special rate for middle-long term rentals. A security deposit against damages of €250,00 is to be left upon arrival. It will be given back upon departure.